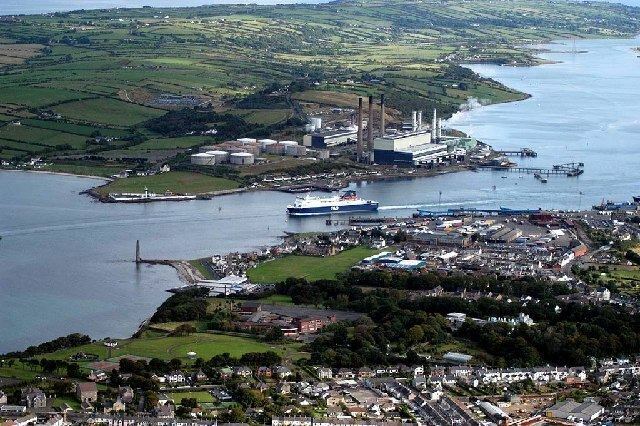 Larne or Lairne ( scots ) (from Irish: , the name of a Gaelic territory) is a seaport and industrial market town, as well as a civil parish, on the east coast of County Antrim, Northern Ireland with a population of 18,323 people in the 2008 Estimate. 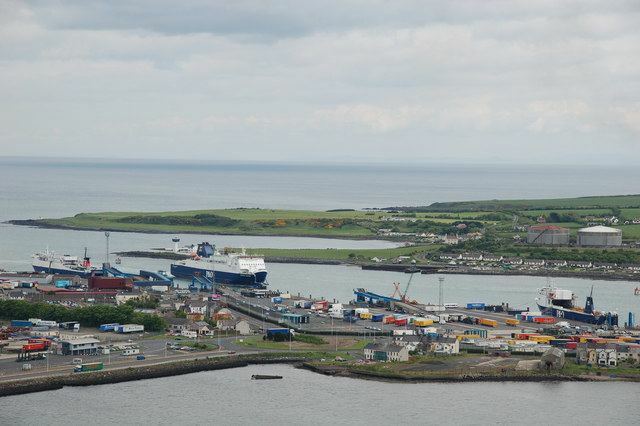 As of 2011, there are about 32,000 residents in the greater Larne area. It has been used as a seaport for over 1,000 years, and is today a major passenger and freight roll-on roll-off port. Larne is twinned with Clover, South Carolina which has named one of its schools, Larne Elementary School, after Larne. Larne is administered by Larne Borough Council. Together with the neighbouring district of Carrickfergus and part of Newtownabbey, it forms the East Antrim constituency for elections to the Westminster Parliament and Northern Ireland Assembly. The coastal area around Larne has been inhabited for millennia, and it thought to have been one of the earliest inhabited areas of Ireland, with these early human populations believed to have arrived from Scotland via the North Channel. The early coastal dwellers are thought to have had a sophisticated culture which involved trading between the shores of the North Channel and between other settlements on the coasts of Scotland. The coast of Scotland is in fact clearly visible from here. Archaeological digs in the area have found flintwork and other artefacts which have been assigned dates from 6000 BC onwards. The term Larnian has even been coined by archaeologists to describe such flintworks and similar artefacts of the Mesolithic era (and one time to describe Mesolithic culture in Ireland as a whole). The river Inver runs through Larne and was the name of a small village( now area in Larne) to one side of the current Larne town. Its name is an Anglicised spelling of Scottish Gaelic inbhir. The oldest recorded name for Larne Lough is the Irish Loch Ollarbha (loch meaning "inlet") and Inbhear nOllarbha (inbhear meaning "rivermouth"). Larne Lough is also recorded that the Roman Emperor Serverus described how, in 204AD, a Roman slave galley bound for Scotland was blown off course and took shelter in a place that they called Portus Saxa ("Port of the Standing stones") – this is thought to have been Larne Lough. The ancient Greeks also had knowledge of the Antrim Coast and Ptolemy, the astronomer and geographer of the 2nd century AD, referred to Islandmagee on one of his maps. According to legend, Lathar, child of Úgaine Mór, ruled a small territory which stretched along the Antrim coast roughly from Glenarm to the Inver River – this territory was thus called Latharna (the lands of Lathar). The area where the modern town sits was known in Irish as Inbhear an Latharna ("rivermouth of Latharna") and was later anglicised as Inver Larne or simply Inver. The territorial name Latharna was only applied exclusively to the location of the present town in recent centuries. There was Viking activity in the area during the 10th and 11th centuries AD. Viking burial sites and artefacts have been found in the area and dated to that time. Ulfreksfjord was an Old Norse name for Larne Lough. According to the Norse historian Snorri Sturluson, Connor, King of Ireland, defeated Orkney Vikings at Ulfreksfjord in 1018. This was later anglicised as Wulfrickford, Wulfrichford and Wulvricheford. Other Norse-derived names for Larne Lough and the surrounding area are found in various records. They include Wokings Fyrth, Wolderfirth, Wolverflete and Olderfleet. The only one that survives is Olderfleet. The ending -fleet comes from the Norse fljot, meaning "inlet". Older- may come from the Norse oldu, meaning "wave". However, P.W. Joyce in his Irish Names of Places suggests that it comes from Ollarbha, the Irish name for the river. In the 13th Century the Scots-Irish Bissett family built Olderfleet Castle at Curran Point. In 1315 Edward the Bruce of Scotland (brother of Robert the Bruce, King of Scotland) landed at Larne with his 6000 strong army en route to conquer Ireland, where Olderfleet Castle was of strategic importance. Edward saw Ireland as another front in the ongoing war against Norman England. In 1569 Queen Elizabeth I, Queen of England and Ireland, appointed Sir Moyses Hill as the governor of Olderfleet Castle. It was seen as strategically important for any Tudor conquest of Ulster. Following the 17th century Union of the Crowns of Scotland, England and Ireland under James VI & I many more settlers would have arrived to Ulster via Larne during the Plantation of Ulster. The area around County Antrim itself, however, was not part of the official 17th century Plantation; instead many Scottish settlers arrived in the area through private settlement in the 17th century (as they had also been doing for centuries before). During the 18th century many Irish emigrated to America from the port of Larne. A monument in the Curran Park commemorates the Friends Goodwill, the first emigrant ship to sail from Larne in May 1717, heading for Boston, New England in the modern United States. Bostons long standing Irish roots can be traced to Larne. The town is documented as being the first in county Antrim to be taken by United Irishmen during the ill-fated rebellion of 1798. The rebels from this area (almost entirely Presbyterian) filled Larne and engaged the government forces around 2am on the morning of the 7th of June. This surprise attack drove the garrison to flee the town, at which point the rebel force marched off to join up with McCracken and fight in the Battle of Antrim. In 1914, Loyalists opposed to the Home Rule Act 1914 prepared for armed resistance. In an episode known as the Larne Gun Running German, Austian and Italian weapons with ammunition were transported into the port of Larne (and Bangor) in the dead of night and distributed throughout Ulster. This event marked a major step in cementing the right to Ulster Unionist self-determination, with the recognition of such a right ultimately leading to the creation of Northern Ireland. Larne sits on the western side of a narrow inlet that links Larne Lough to the sea. On the eastern side of the inlet is a peninsula called Islandmagee. To the west of Larne is the ancient volcanic formation of Antrim Plateau, with its glaciated valleys scenically sweeping down to the sea the to the north of Larne in what are known as the Glens of Antrim. Larne is 25 miles from the Scottish mainland, with stunning views across the North Channel towards the Mull of Kintyre, Rhins of Galloway, Islay and Paps of Jura often visible from the Larne area – this proximity to Scotland has had a defining influence on Larnes history and culture. Many streets in Larne end in Brae which comes from the Lowland Scots for Hillside. Here are just 2 of many.